**NOTE** - This item is just the Tofurky stuffed roast and is not the complete Tofurky feast with gravy and drumsticks. The feast is sold separately on our website during appropriate holiday seasons in fall and winter. 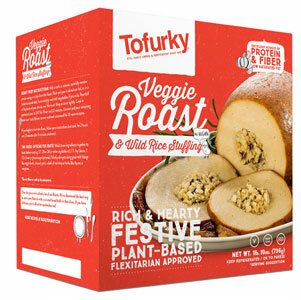 Love the Tofurky roast but don’t need all the extras that come with it? If so, this streamlined meal is for you! Inside each package is one large Tofurky Roast, stuffed with breadcrumbs, brown and wild rice, veggies, herbs and spices. Weighing in at 1 lb. 10 oz., this roast gives offers plenty to share for a get-together or family dinner, or, it quite possibly will leave you with enough leftovers to cover your meals for a few days. Ready in less than 90 minutes, you can have a tasty Tofurky meal soon after you thaw it, perfect for holiday dinners or any night you’d like a hearty feast. $14.99 each. Roast ingredients: Water, vital wheat gluten, organic tofu (filtered water, organic whole soybeans, magnesium chloride, calcium chloride), non-GMO canola oil, natural vegan flavors, shoyu soy sauce (water, non-GMO soybeans, wheat, salt, culture), non-GMO corn starch, white bean flour, garbanzo bean flour, lemon juice from concentrate, onion, carrot, celery, vegan sugar, calcium lactate from beets, sea salt. Stuffing ingredients: Organic brown rice, whole wheat bread cubes (enriched wheat flour, water, organic sugar, sea salt, yeast), onion, celery, water, organic wild rice, expeller pressed non-GMO canola oil, natural vegan flavors, garlic, salt, vegan sugar, spices, and tumeric (added for color). 1. This item is perishable and should be shipped with a Cold Bag or Cold Box Shipper (see below at the bottom of this page for options to add to your order, it is not included) and shipped via 2nd Day Air to ensure maximum freshness (unless you are within a 2 day ship time from Wisconsin.) The following states can be shipped via UPS Ground to arrive within 2 days: WI, IL, MN, IN, MI, IA, MO, OH, KY, TN, WV, NE, KS (eastern half of state), GA (northern half of state), ND (eastern half of state), PA (western half of state), and NY (western half of state.) If you do not live in one of the above mentioned states, we strongly urge you to choose 2nd Day Air for your shipping option. We cannot guarantee freshness or replace perishable items if the shipping time is longer than 2 days and if a Cold Bag or Shipper Box is not included. These need to be added to your order. 2. Orders with a Cold Bag or Shipper are shipped Monday through Wednesday – all orders placed around 1:00 pm on Wednesday usually will be held for shipment until the following Monday to ensure that they are not left in a UPS facility over the weekend. 4. This product can only be shipped in the United States. Orders outside the USA that contain this item will have the item removed before it is shipped. From Lisa Watkins of Lakewood, Colorado on 11/2/2018 . I look forward to Thanksgiving every year so I can eat this roast. I recommend to to anyone looking for a tasty treat at the holidays. I don't like the stuffing I make my own but the roast is good hot or cold. The next day I eat it with vegenaise. From Shelby Price of Fort Myers, Florida on 8/26/2018 . Tofurky does not make a bad product. This roast is amazing for thanksgiving (and leftover sandwiches!) it’s so delicious any way you eat it! From Anonymous of Fruitport, Michigan on 12/3/2017 . Loved it! Tried it for Thanksgiving this year, and was really worried I wasn't going to like it, but it was so good! Loved the stuffing and gravy too! Want to Eat it All Year Round! I crave this roast all year round. I've tried every veggie turkey alternative there is and none of them even compare to Tofurky. Also, leftovers are awesome for thanksgiving sandwiches! This was my first Thanksgiving as a vegetarian, so I tried this roast to replace the turkey in my meal. I had a few great recipes I combined and used a crock pot recipe with low sodium organic vegetable broth, potatoes, garlic, onions, carrots, and herbs. It smelled and looked amazing, but it missed the mark. Texture was weird...very slippery and too "smooth". The sodium content was through the roof. It tasted like I was just eating pure gooey salt! I know a lot of people like this, but it just wan't for me...and I REALLY wanted to like this and put a lot of effort into making it. Thankfully, I had purchased the Gardein Turk'y roast as well, and I had that as a back up. Next year, I will go with Gardein!